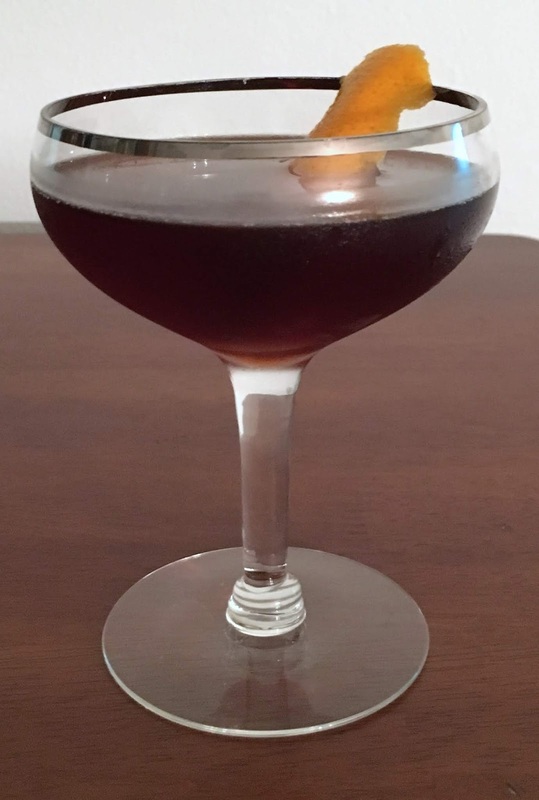 While rye and Ramazzotti go together in any number of drinks ranging from the Brooklyn to the Black Manhattan, I've never seen them together in the mold of a Boulevardier, with the close exception of the Canon Cocktail by Jamie Boudreau, which still fancies up that basic combination. But sometimes simplicity is just as good as complexity. Combine all ingredients, stir with ice for fifteen seconds, then strain into a chill cocktail glass and garnish with a strip of orange peel. The nose is balanced between rye grain, orange peel, and herbs/mint. The sip opens with sweet grape notes, then it counterbalanced by bitter notes from the rye and amaro/vermouth, with a grain and herbal fade at the back, and a rounded orange note throughout. The herbal character of Ramazzotti goes really well with the spiciness of rye, giving a different emphasis than with Campari in the classic Boulevardier. With that said, it does take a fair amount of rye to hold up against the very strong flavors of the amaro, so if you're making this with a lower proof rye you might need to up it to 1.5 oz to keep everything in balance. Overall I'm really happy with how this turned out.